The night before the Festival of Rock Posters kicked off in the Hall of Flowers at Golden Gate Park, there was a pre-show party at Hangar 18 in Oakland, CA. Hangar 18 (H18) is a showcase for artwork in the unique setting of Chuck Sperry’s screen printing studio in Oakland, California. The H18 Project is an ongoing pop up gallery where collectors are presented with a unique studio experience. 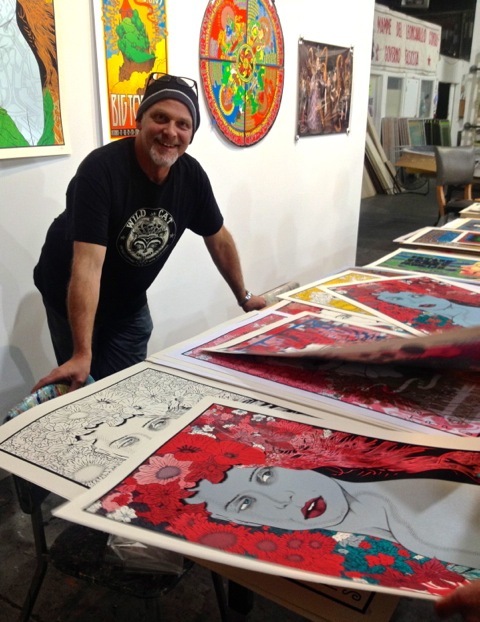 The exhibit Hometown Disadvantage featured art by Chuck Sperry and Chris Shaw. TRPS member Ron Schaeffer was at the event and took some pictures to share. Cheers!